Google Takeout is an online service that helps to download or export data of various services of Google. 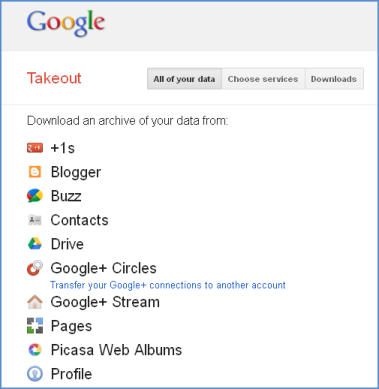 Takeout service is maintained by Data Liberation Front, and now they added two popular services Blogger and Google Plus. Some of the services already connected in Google Takeout are Buzz, Contacts, Drive, Picasa, Reader and YouTube. How you can download your Blogger Data? You can export each of your blogs as an Atom Xml file in one place. 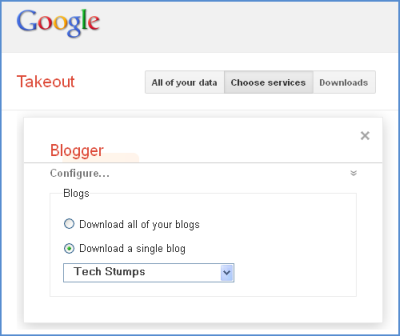 Go to Google Takeout page and click on Choose Services and select Blogger. You will see number of your blogs and its estimated size. You can download all blogs or you can configure what blog to be exported. Then click on Create Achieve to download your data. How to Download your Google+ Data? Also you can download or export all of your Google Plus profile data such as Profile information, Google+ Stream, Circles, Pages and +1 detail. Your Google+ posts will be downloaded as Html files and your Circle details are as json files.